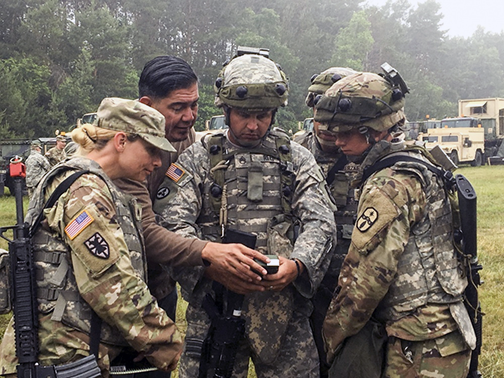 Oscar Hernandez (second from left), a training specialist from the U.S. Army Space and Missile Defense Agency, guides Ohio Army National Guard Soldiers from the 1487th Transportation Company on how to detect electromagnetic interference on an AN/PSN-13 Defense Advanced GPS Receiver (DAGR) during annual training at Camp Grayling Joint Maneuver Training Center in Grayling, Michigan. This training provides Soldiers guidance in the event they encounter a contested electronic warfare environment. Photo is courtesy of the Ohio National Guard and Sgt. Michael Carden. Knowing your location and the location of the enemy is paramount on the battlefield, and with the advent of satellites and GPS, U.S. Soldiers can pinpoint their exact position down to the meter. 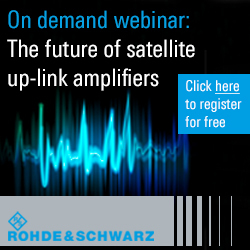 What happens when that signal is jammed? Ohio National Guard Soldiers are training with a team from the U.S. Army Space and Missile Defense Command, Army Strategic Command (USASMDC/ARSTRAT) on how to identify and mitigate electronic warfare that targets GPS systems. Terza’s team provides training and resources to both Soldiers maintaining communication and data networks and Soldiers out in the field who are most likely to encounter electronic warfare. Most Soldiers are familiar with the Defense Advanced GPS Receiver (DAGR), commonly referred to as a '"dagger." It's a hand-held GPS receiver that is used in conjunction with many Army systems such as satellite receivers and battlefield command systems, but how they work is a mystery to many. Soldiers were able to get hands-on with their DAGRs, learning how to recognize when they were being jammed and how to mitigate the electromagnetic interference (EMI). With the team from USASMDC offering guidance, Soldiers were able to triangulate and find the device that was blocking their signals. Merzke added that this is stuff we need to know to be able to train better Soldiers and to keep them safe and bring them home alive. Story by Staff Sgt. Michael Carden, Ohio National Guard Public Affairs.